This picture doesn't really give this card justice, but it really is a beautiful card and again can be used for many occasions. 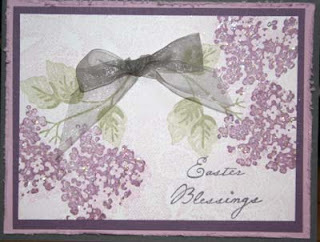 Use Distressor tool on edges of Pale Plum cardstock. Stamp Fine Lace on Whisper White with Pale Plum ink (subtle). Stamp with Pale Plum the 1st Step of the 2 Step Stamp flowers. Stamp over with Perfect Plum with the 2nd Step highlight stamp. Stamp desired greeting in Basic Gray (or perfect plum). Tie and adhere bow with mini glue dots.